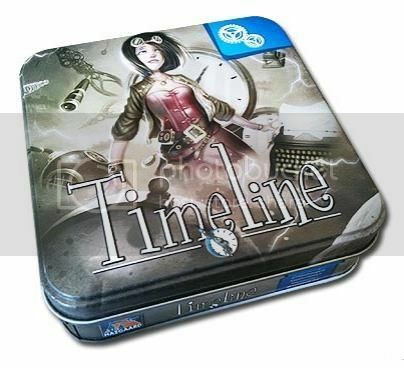 Home > 2012 > November > GamerChris Holiday Gift Guide – 2012! Games, games games! I love games! It’s so great to give and get games for Christmas, or, really, any holiday. And while it’s pretty awesome that more and more quality games are becoming available at Wal-Mart, Target, Barnes & Noble and other places, it can also be pretty difficult to really know which ones are really good. So, for the 5th year in a row, I’m here to help you make some cool choices if you want to bless someone else with a game this holiday season (or, I suppose, if you’re looking for a game or two to go on your own Christmas list). Below, you will find 30 games that I think will make really fantastic gifts. And between the 5 different categories, you should hopefully be able to find a game for almost anyone on your list. And if that’s not enough, most of the games I mentioned on my previous gift guides are still available, so you can check them out for even more ideas: 2011 Gift Guide, 2010 Gift Guide, 2009 Gift Guide, 2008 Gift Guide. 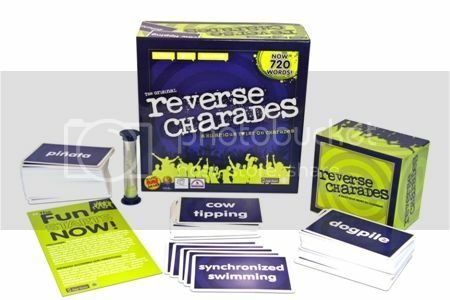 Reverse Charades – This is sort of like Charades, except in reverse (heh, heh… ain’t I witty…). Instead of just one person on the team being on the spot and having to act things out and look stupid while everyone else sits back and tries to guess, you have just one person trying to guess while everyone else acts out the words and looks silly together. It’s a small change to the game, but it makes all the difference in getting people to open up and have fun, making it an absolute blast to play! 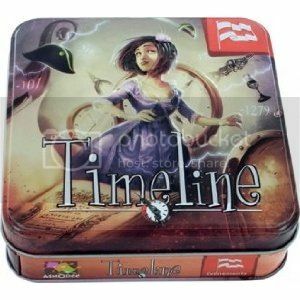 Timeline – This is a very simple game for a slightly less raucous party. Basically, you’re given a hand of cards that each have some historical event, invention, discovery or something else on them. 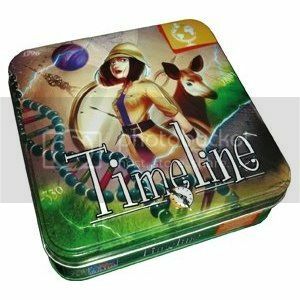 And then you take turns adding the card to the timeline in, hopefully, the right place. It’s certainly a big hit with history buffs, but even with just us regular folks, it’s a lot more entertaining than you’d think to see how good or bad your idea of history is! And currently, there are actually 3 different “sets” available for the game: Inventions, Historical Events, and Discoveries, each for just $15, and which can also all be combined to make one even bigger game. Snake Oil – This is a game all about trying to sell ridiculous products to people. A customer card is flipped over by the judge for the turn, and then everyone else hurries to combine two of the cards from their hand to make a product that the person might want. Then, they have to make their best “snake oil salesman” pitch to try and convince the judge that theirs is the one to buy! 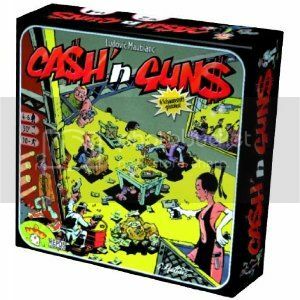 Ca$h ‘n Gun$ – You’re a gang of bad guys trying to divide up the loot after a big heist. But just to make sure you get your fair share, you (and everyone else) brought your gun along. So turn after turn, you decide on how to load your (orange, foam) guns, point them at each other, and try to intimidate your buddies into backing out. It’s silly and fun, and you get to point foam guns at each other, so if that sounds like something you’d like, then give this a try! 4-6 players, 30 minutes to play, Cost: $50 – Available online and in some specialty book and educational stores. Wits & Wagers Family – This is a light trivia game that’s really more about estimation and knowing your friends than it is about knowing the exact right answer. 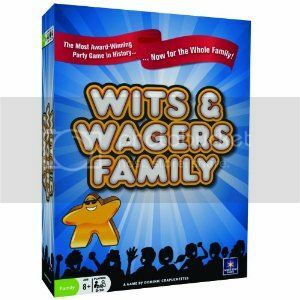 If you’ve seen or played regular Wits & Wagers, the family version is different both because the questions are a little more aimed at things everyone in the family would care about and because the scoring has been streamlined. 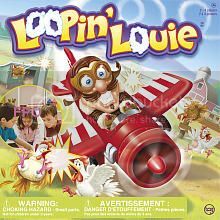 Loopin’ Louie – This game has a cool little motorized airplane that flies around trying to knock chickens off their roosts. So your job is to defend your chickens by deflecting Louie and his plane away, while trying to bounce him in a way to land on the other players’ chickens. It’s fun and quick, and it’s just come back into print! 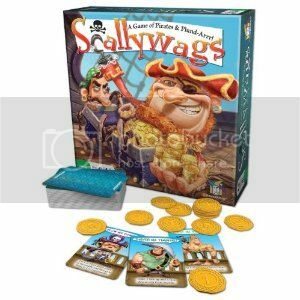 Scallywags – This is a cool little pirate-themed card game where you try to collect, steal, and flip over some plastic doubloons worth different vaules. Every pirate has to get the same cut of the booty (number of doubloons), but the values on them are what will make the difference in who wins! 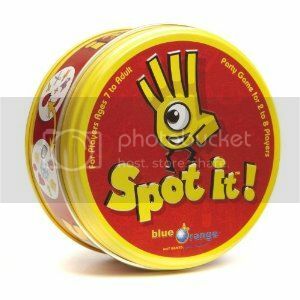 Spot It – The cool thing is that in this little deck of rounds cards, any two cards will share exactly one identical picture. 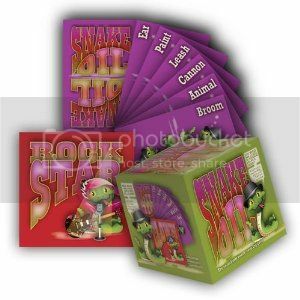 You actually get 4 different games to play with the cards, all of which are quick and fun for all ages, and which deal with matching or identifying the common pictures on different cards. 2-8 players, Ages 5+, 15 minutes to play, Cost: $14 – Available in some hobby game stores, some educational toy stores, and online. 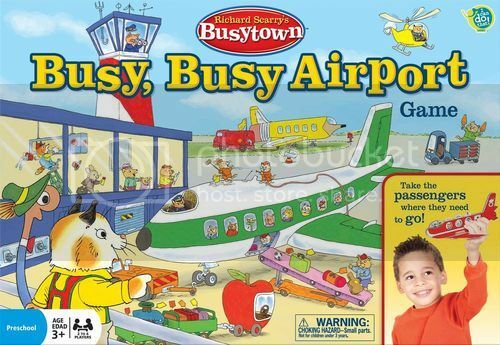 Richard Scary’s Busytown: Busy, Busy Airport – In this game, you don’t really play just on a table. You put the main airport in the center of the room, but then put the other destinations anywhere else in the room or even further away, and fly little cardboard planes all around trying to deliver passengers and cargo wherever they want to go. It’s probably as much toy as game, and even the youngest players will have a great time with it. 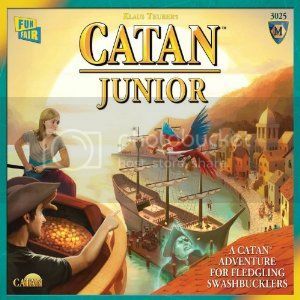 Catan Junior – The Settlers of Catan is one of the staples of modern boardgaming, and Catan Junior is a kid-friendly version of it that you can introduce to children as young as 5 or 6. 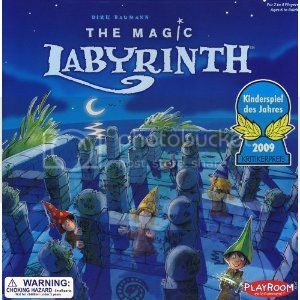 The Magic Labyrinth – This is a cool little maze game, except that the maze itself is actually under the board. You and your kids will have to remember where the walls are, because your playing piece is connected by a magnet to a ball under the board, and if you try to move through a wall, it’ll fall off! Recommendations from previous lists: Take the Cake, Heroica, Go Away Monster!, Rory’s Story Cubes, Sherlock, Animal Upon Animal, Castle Keep. 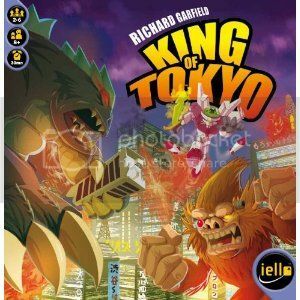 King of Tokyo – You play giant Godzilla-like monsters fighting over the right to crush Tokyo and earn points. It’s a dice-rolling “king of the hill” style game, where you’re either in Tokyo (earning points but being attacked by all the other players) or your not in Tokyo (where you can heal and beat up on the monster who is in Tokyo). You can even save up energy to buy cards that give you cool special powers that really make the game interesting. It’s a lot of fun for families that like “take that” sorts of games. 2-6 players, 30 minutes to play, Cost: $40 – Available in hobby game stores and online. 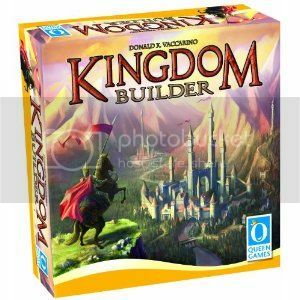 Kingdom Builder – This won the German Game of the Year award this year (which is a really big deal), and in it, you place little houses down on the board to try and meet the three scoring conditions. The rules are extremely simple, but the variability and strategy is really impressive because the ways to score change each game. You can even check out my full review for more information about it. 2-4 players, 45 minutes to play, Cost: $60 – Available in Barnes & Noble, in hobby game stores (Hypermind), and online. 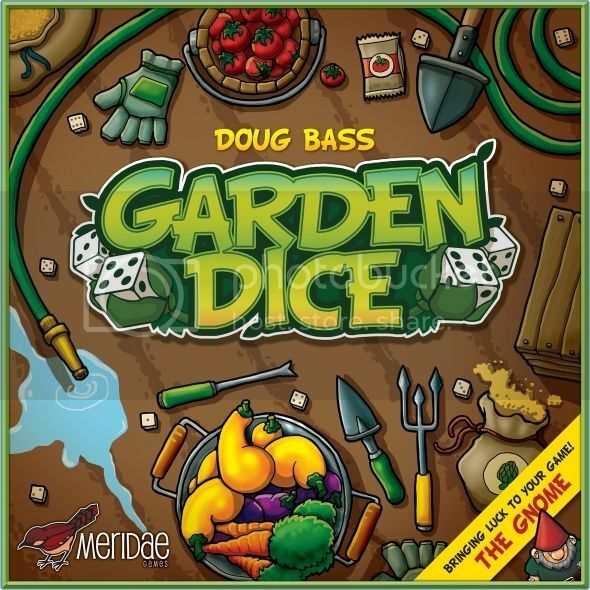 Garden Dice – This is a gorgeous little dice-based game about planting, watering, and harvesting veggies in a shared garden. It’s simple and fun, but there’s also a lot of depth in the choices you get to make with your dice each round. You can also check out my full review for more information about it. It’s just been released, though, so you may be able to find it on some local game-store shelves or online, but the best place to find it is probably directly from the publisher on their web store. 2-4 players, 60 minutes to play, Cost: $40 – Available directly from the publisher’s web store, and hopefully soon in hobby game stores and other locations. 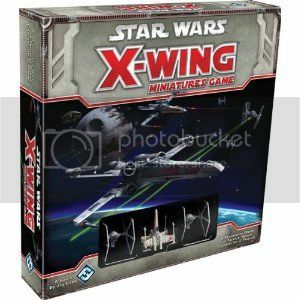 Star Wars: X-Wing Miniatures – Okay, so you get really awesome-looking Star Wars starfighters. And you get to fight with them. AND the game is really good. For any big fan of Star Wars (and probably even for a lot of people who aren’t), this will be a total blast to play. The base set includes 2 TIE Fighters and an X-Wing, which is a lot of fun to play with alone, but then there are also more (non-random) expansion packs that you can buy to add even more variety and excitment to your awesome space battles! Pew pew! 2 (or more) players, 30 minutes to play, Cost: $40 (for the base set, $15 for expansion ships) – Available at Barnes & Noble, Target, hobby game stores (Hypermind) and online. 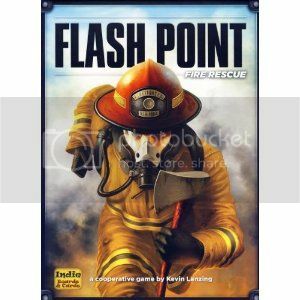 Flash Point: Fire Rescue – This is a really excellent cooperative game about being firefighters. You all work together to choose the right roles, enter a burning house, and rescue all the family members. It’s tense and exciting, and seems to give at least a little taste of what it would be like to be a real firefighter. 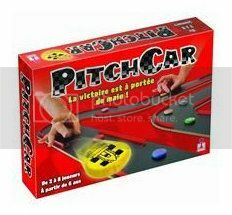 PitchCar – I often include one “big ticket” item on this list, and if you have the money to spare, PitchCar is a pretty awesome addition to any family game closet. Basically, it’s a game about racing cars around a track, but instead of using some electronic device to move the cars, you flick the little car discs with your finger. Both just with the base set (which has lots of twists and turns) or with some of the expansions (which have jumps and other cool things), this game is a total blast to play with up to 8 kids and adults of any age. 2-8 players, 30 minutes to play, Cost: $60-70 – Available at hobby game stores (Hypermind) and online. Recommendations from previous lists: Survive: Escape from Atlantis, Tsuro, Forbidden Island, Tobago, Qwirkle, Sorry Sliders, Ticket to Ride. This is a whole new category starting this year. Before, I would have probably included these games in with the Family or Children’s games, but since they have such a low price point and small profile, I think they probably deserve their own special place. All of these are accessible to almost anyone, are quick to set up and play, and still pack a pretty hefty punch in gaming fun! Bears! – This is a real-time dice-rolling game about camping in an apparently bear-infested forest. 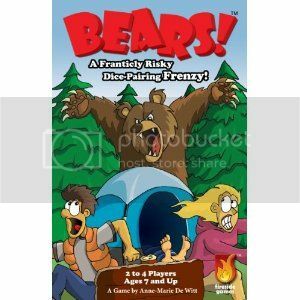 There’s a big element of matching dice of different types, but there’s also sort of a push-your-luck element to deciding how to make your matches, because some things score differently depending on whether any bears are left unmatched at the end of the round. 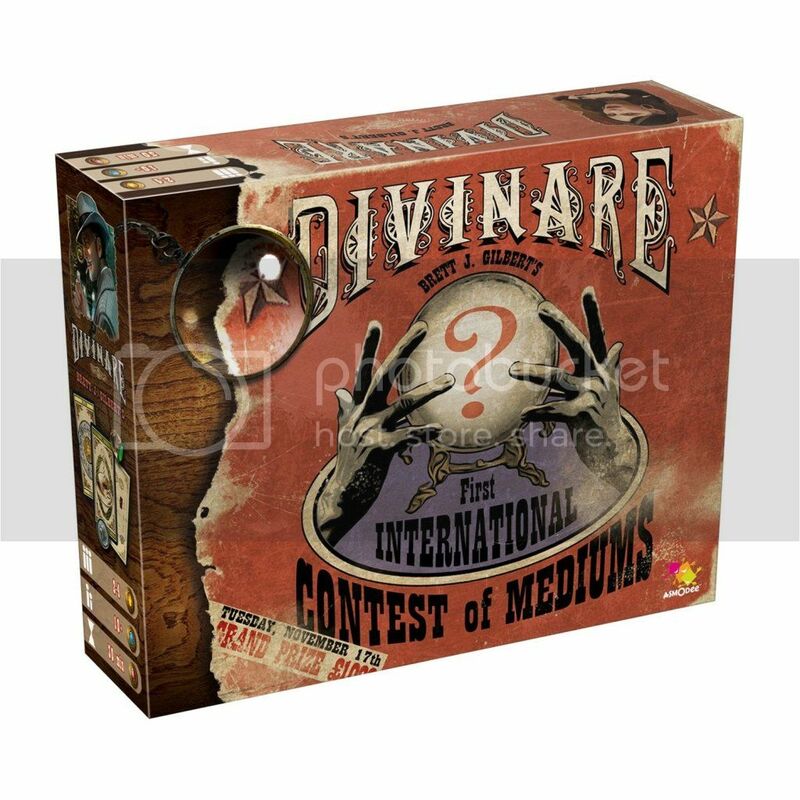 Divinare – This is a brand new little game about being fortune tellers. It’s sort of a mix between a light deduction game and a really solid hand-management game where you have to make predictions about how many cards are in play for each color. It’s pretty unique and a lot of fun! 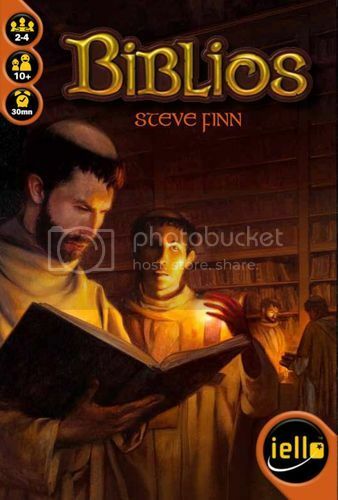 Biblios – This little card game is played in 2 phases. First, you take turns drawing cards from the deck in the donation phase, where one card goes to you, one goes to each other player, and one is set aside for the 2nd phase of the game. But the twist here is that you draw one card at a time and have to make a decision about it before drawing the next one. And then, in the auction phase, you use the gold cards in your hand to buy the rest of the cards that were set aside. It’s incredibly interesting and dynamic to be so quick, and it’s definitely one of my favorite fillers right now. 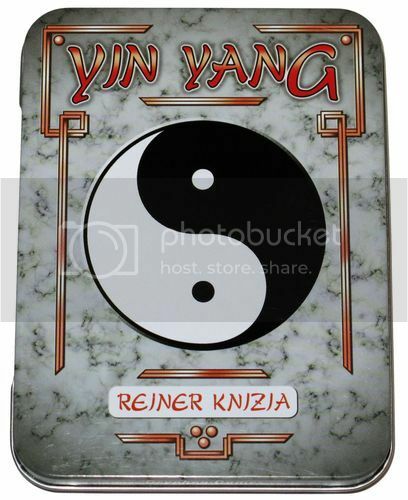 Yin Yang – Yin Yang is a light trick-taking card game where you try to end with no points at all. The person with the highest card each trick gets some black points, and the player with the lowest card gets some white points. But white points cancel black points, so you can try to purposefully pick up the other color to cancel out points you get in a previous round. It’s a great little game that’s easy to teach and quick to play. 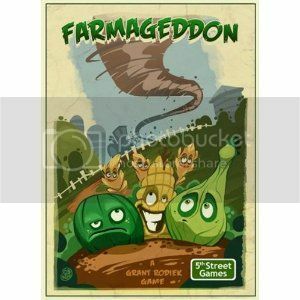 Farmageddon – This is a wide-open card game about hyper-competitive farming. You plant and fertilize crops in the 3 shared fields, but then get to play action cards to do all sorts of wacky things both with your own plants and to the other players. The art is just fantastic, and if you like “take that” sorts of games, this is a great little one to pick up! Castles of Burgundy – Stefan Feld is one of my favorite designers right now, and he’s always looking to make a new twist on old ideas. 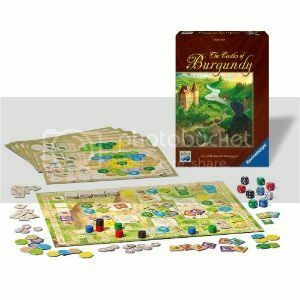 In Castles of Burgundy, he has crafted perhaps the most well-balanced dice game ever, where you use the dice rolls you have each round to pick up tiles, place them into your kingdom, and sell goods. It’s great with any player count (from 2-4 players), has a lot of strategic variety, and to top it all off, it’s actually a lot of fun to play. 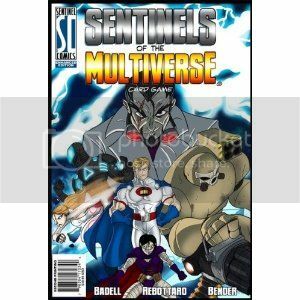 Sentinels of the Multiverse – It’s a cooperative, comic book card game… and it’s pretty darn awesome. Each player chooses a hero and takes their own, unique deck of cards as you all work together to face off against one of the many villians in some particularly dangerous environment. All of the heroes have very definite strengths and weaknesses, which all come through very well in play, making each one unique and interesting to try. And even though it doesn’t have ties to any established comic book universe, any comic book/superhero fan would love to jump into this world and experience all it has to offer. 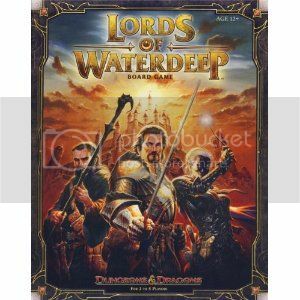 Lords of Waterdeep – Lords of Waterdeep has two big things going for it. First, it’s a really solid european-style boardgame that would be a great introduction to modern boardgames for almost anyone. Second, it uses the Dungeons & Dragons setting of Waterdeep that many roleplaying fans may already be familiar with. So if you know someone who has interests in both the RPG and boardgaming sides of the hobby, this may be a great choice for them. 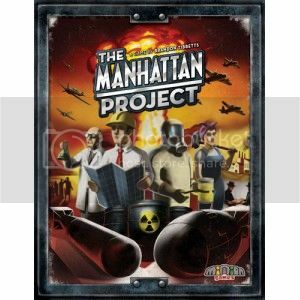 The Manhattan Project – This is a really fantastic worker-placement game, but unlike many other games in this category, it also brings a ton of both direct and indirect player interaction to the table as well. Players compete as countries trying to race towards building the most powerful nuclear arsenal, which is a really unique theme that plays very strongly into how the game actually plays. The only thing going against this game is that Minion Games has had a lot of trouble getting it back into print after selling through its first print run earlier this year. But the next run is supposed to arrive any time, so keep an eye out for it on their website and eventually in hobby game stores everywhere. 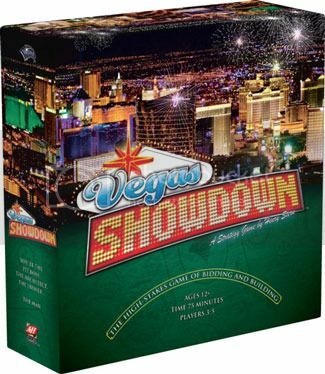 Vegas Showdown – Vegas Showdown is another game that has just come back into print. It’s mostly an auction game where you are the owner of a huge hotel/casino in Las Vegas, and you’re trying to get enought people and income from various gaming tables and restaurants to be the most successful casino on the strip. It’s another great introduction to modern boardgames, but it still also has enough meat to it that experienced games can still be satisfied by it as well. 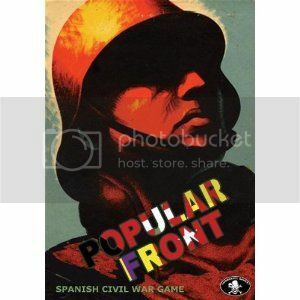 Popular Front – Unlike all the other games on this list, Popular Front is a wargame. Well, it’s sort of a wargame about the Spanish Civil War, anyway. It’s definitely about war, even though the actual mechanics of the game are pretty abstracted. But in my plays of it so far, I’ve been very impressed in how it represents both the political and the military components of the war, and how well its abstract mechanics model real-world elements. If you know someone open to the theme, Popular Front is a really interesting game to try out with them. 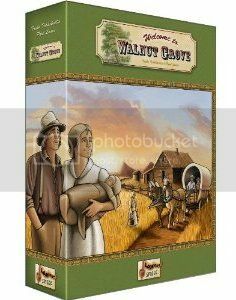 Walnut Grove – You’re settlers on the praire, trying to eek out a living for yourself and your family. Well, the game isn’t really all that terribly thematic, but it’s still a really interesting little amalgamation of different game mechanics. Over 8 “years”, you build up your homestead by adding new tiles to it, then you assign your farmhands to collect different resources from it, then you head off to town to buy, sell, or build different things to help you out. It’s very accessible and fun, and does well supporting play from 4 players all the way down to even working well as a solo game. 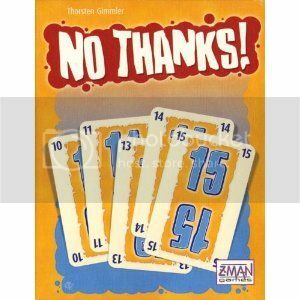 And if these 30 game suggestions aren’t enough for you, you can also check out the 2012 Gift Guide at BoardGameGeek for even more options. You did a great job, as always, this year with your gift guide. You picked some good games!